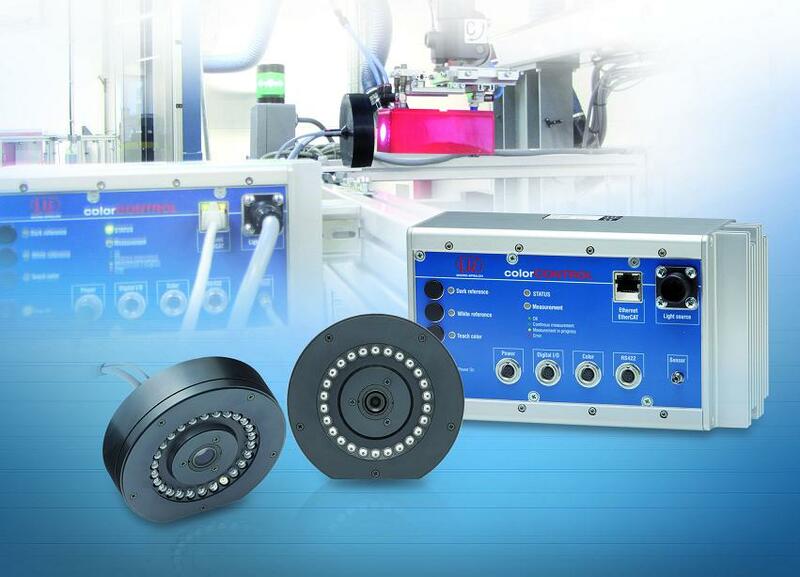 High speed system for measuring colours can be used in manufacturing environments to monitor process output quality. Micro-Epsilon has launched an inline high speed colour measurement system, which measures the actual colour of the target by identifying their coordinates in the colour space. The new colorCONTROL ACS7000 colour measurement system identifies colours using any of the XYZ; L*a*b*; L*u*v*; RGB and DIN99 measurement definitions (user selectable). The system can be set up to continually monitor a production process and output the colour measurement via Ethernet, EtherCAT or RS422 and can also be taught pass fail/limits and then output out-of-tolerance alarms using digital I/O. The system is therefore suitable for a wide range of applications where colours and shades must be examined on-the-fly and to very high accuracies. Existing applications include automotive paint inspection, colour measurement of car interiors, coloured glass, transparent film and sheet production, printing, packaging, medical technology, food, cosmetics, pharmaceuticals and in the processing of plastics, food, wood, paper, veneer and textiles. The system is equally suitable for offline R&D laboratory applications. True colour measurement is required in many industry sectors, enabling companies to select, monitor, grade and sort various types of coloured objects involved in manufacturing, automated handling, warehousing, packaging, wrapping and other production processes. Measured objects can take the form of solids or liquids and the user may also have a need to recognise the colours of transparent surfaces such as coatings or labels, as well as LEDs or lamps. The addition of the colorCONTROL ACS7000 to the existing range of colour measurement sensors means that Micro-Epsilon is now able to offer customers in the UK one of the widest ranges of colour measurement systems and sensors in the world – from standard to mid- and high performance requirements – all available from a single source. The colorCONTROL ACS7000 series has a choice of three different sensor families: the ACS1, circular sensor (ACS2) and a transmission sensor (ACS3). Designed for different measurement tasks, each family has specific optical angles, spot geometries and focal distances. The ACS1 sensor has been designed with the transmitter and receiver mounted inside one sensor head. The optics are arranged at an angle of 30°/0° to each other, producing a working distance of 50mm from the target. An optional adapter allows the sensor to be used manually, whereby the user can hold the sensor in their hand and rest the sensor head onto the target to be measured. The ACS2 circular sensor is used for colour measurement of structured and highly reflective surfaces, including lustrous metals. In the sensor, 24 lighting optics are arranged in a circular fashion around the receiving optics, providing a constant light output. This allows the measurement to be executed independently of the angular position of the measurement object. Two versions of the ACS2 are available with different spot sizes and measuring distances. The ACS3 transmission sensor is used for measuring the colour of self-luminous, translucent or transparent objects. The ACS3 family can be supplied in three different versions, each of which has specific transmitter-to-receiver distances and measurement spot diameters. A key advantage of the ACS3 sensor is its ability to produce very stable and accurate inline colour measurements in high speed production processes, making it ideal for transparent and translucent materials, e.g. films and foils. For measuring the colour of self-luminous objects, only the receiver unit is required, enabling a more conventional one-sided colour measurement set up.